Commemorates the baptism of Jesus in the River Jordan by Saint John the Baptist. Born to wealthy polytheistic, pagan nobility, Hilary's early life was uneventful as he married, had children (including Saint Abra), and studied on his own. Through his studies he came to believe in salvation through good works, then monotheism. As he studied the Bible for the first time, he literally read himself into the faith, and was converted by the end of the New Testament. 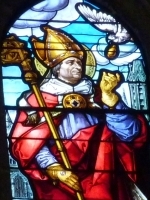 Hilary lived the faith so well he was made bishop of Poitiers, France from 353 to 368. Hilary opposed the emperor's attempt to run Church matters, and was exiled; he used the time to write works explaining the faith. His teaching and writings converted many, including Saint Florence of Poitiers, and in an attempt to reduce his notoriety he was returned to the small town of Poitiers where his enemies hoped he would fade into obscurity. His writings continued to convert pagans. He introduced Eastern theology to the Western Church, fought Arianism with the help of Saint Viventius, and was proclaimed a Doctor of the Church in 1851. Born to a pious family, the son of a pharmacist, he received early religious training from his mother. 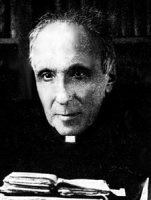 Though his father hoped Francesco would take over the family business, the boy felt a call to the priesthood, studied in Naples, Italy, and was ordained in the archdiocese of Cosenza-Bisignano, Italy on 17 December 1881. Parish priest at the church of Saint Nicholas in Acri, Italy through 1887; while there he organized the construction of the Caritas hospital. 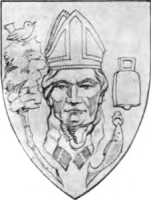 Diocesan archpriest in 1888. Professor of theology. Believing that anyone who understood the faith would follow the faith, Monsignor Francesco concentrated on teaching, evangelizing and catechizing the young, and setting up training for new catechists. In 1892-1893, with Sister Maria Teresa de Vincenti, he founded the Little Workers of the Sacred Hearts who continue their good work with today with the poor and abandoned in Albania, Argentina, Africa, Jamaica, Italy, India, the Holy Lands and the United States. Grandson of the British prince Lothus; son of Saint Theneva. Hermit. Monk. Missionary to Scotland, beginning at Cathures. Bishop of the Strathclyde Britons in the area of modern Glasgow in 540. He taught and led there for 13 years, living in great austerity. Exiled in 553 during an anti-Christian uprising by local pagans, he fled to Menevia, Wales, where he stayed with Saint David of Wales. He founded a monastery at Llanelwy, and served as its first abbot. He returned to Scotland in 573, evangelizing the areas of Galloway and Cumberland. He returned to Glasgow in 581 and led his people there for his remaining 22 years. Apostle to northwest England and southwest Scotland. Glasgow's Coat of Arms includes a bird, a fish, a bell and a tree, the symbols of Kentigern. • The Bird commemorates the pet robin owned by Saint Serf, which was accidentally killed by monks who blamed it on Saint Kentigern. Saint Kentigern took the bird in his hands and prayed over it, restoring it to life. • The Fish was one caught by Saint Kentigern in the Clyde River. When it was slit open, a ring belonging to the Queen of Cadzow was miraculously found inside it. The Queen was suspected of intrigue by her husband, and that she had left with his ring. She has asked Saint Kentigern for help, and he found and restored the ring in this way to clear her name. • The Bell may have been given to Saint Kentigern by the Pope. The original bell, which was tolled at funerals, no longer exists and was replaced by the magistrates of Glasgow in 1641. The bell of 1641 is preserved in the People's Palace. • The Tree is symbol of an incident in Saint Kentigern's childhood. Left in charge of the holy fire in Saint Serf's monastery, he fell asleep and the fire went out. However he broke off some frozen branches from a hazel tree and miraculously re-kindled the fire. Born to the Gallo-Roman nobility, the son of Emilius, count of Laon, and of Saint Celina; younger brother of Saint Principius of Soissons; uncle of Saint Lupus of Soissons. A speaker noted for his eloquence, he was selected bishop of Rheims (in modern France) at age 22 while still a layman, and served his diocese for 74 years. He evangelized throughout Gaul, working with Saint Vaast. Spiritual teacher of Saint Theodoric. Converted Clovis, king of the Franks, baptising him on 24 December 496; this opened the way to the conversion of all the Franks and the establishment of the Church throughout France. Blind at the time of his death. Grew up in a poor peasant family in a small village, doing chores and working the fields. She had no formal education, and tried unsuccessfully to teach herself to read at night. She began to have religious ecstasies, visions of the life of Christ, and was taught her catechism by the Virgin Mary. Our Lady explained it in the form of three mystical letters, one that signified purity of intention, the second abhorrence of complaining, and the third a reminder to daily meditate on the Passion. 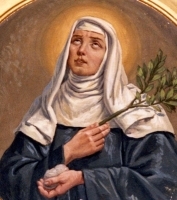 Augustinian lay-sister at the convent of Saint Martha, Milan, Italy, at age 22, being instructed for three years before she was allowed to join. Assigned to beg alms in the street for the support of the house. She suffered alternating bouts of intense physical pain and religious ecstacies for years. She received a vision of Christ in 1494, and was given a message for Pope Alexander VI; she made a journey to Rome, Italy to deliver it. Following a six-month illness, she died on the date she had prophesied. Born to family that was wealthy but indifferent to the faith. Forced into an arranged marriage at age 13. Mother of three, though one died in childhood. Widowed at age 18. She turned away all suitors to care for lepers for eleven years while she raised her children. Had an ongoing dispute with her father over her charitable spending, which he considered excessive. With her children grown, she retired from the world to become an anchoress her remaining years. Had mystical gifts including the ability to read hearts and visions of distant events. Miraculously received Communion. Converted her father and one of her children. Nothing reliable is recorded about his life before his service to the Church. Patriarch of Antioch. Friend and advisor to empress Saint Helena. Named bishop of Treves, Gaul (modern Trier, Germany) by Pope Sylvester I; served for 20 years. Attended the Council of Arles in 314. Built many churches in the diocese, and made provision for the Relics of Trier, which were collected by Saint Helena during her travels through the Holy Lands. Saint Maximus and Saint Paulinus taught in Agrecius's schools, and he was acquainted with Saint Athanasius. Because of his association with several saints and with the relics of others, he became the subject of much pious fiction. Priest. Bishop of Blera, Italy from 457 to 484. Noted for his vocal opposition to the pagan and corrupt local nobility. Some of them bribed Vivenzio's servants to put women's clothing in his chambers in order to accuse him of illicit relations. Vivenzio denied any wrong-doing, then moved to a nearby cave in order to do penance for the sins of his accusers. He lived there for seven years in prayer and fasting, eventually going blind; when he needed to see again in order to implement an instruction he received from God in a dream, his sight was restored. Nun. Member of the Calasanzian Institute, Daughters of the Divine Shepherdess. Superior of the convent-school in Martos, Spain. Martyred in the Spanish Civil War. For a man whose work has had such an impact, surprisingly little is known about him. May have been a member of a noble and wealthy family, but records are obscure. Benedictine monk at Saint Martin's monastery, Autun, France. Abbot of the Baume Abbey where he rebuilt, restored and reinvigorated the monastery. Spiritual director of Saint Odo of Cluny. Founded the monastery of Gigny, Bourg-Dieu, Massay, and served as its abbot. Planned, founded, and built the monastery of Cluny whose reform has had enormous influence throughout western Christendom. He served as its first abbot from 910 to 926. Trinitarian nun. Martyred in the Spanish Civil War. Married lay Dominicans in the apostolic vicariate of Central Tonkin (modern Vietnam). Tortured and executed in the persecutions of emperor Tu-Duc rather than stomp on a cross as ordered. Martyr. Priest in the archdiocese of Katowice, Poland. Imprisoned, tortured and martyred in the anti-Christian persecutions of the Nazis. Court chaplain to William the Conqueror in England. Hermit in the forest of Arrouaise, Artois (in modern France) in 1090. His reputation for sanctity attracted disciples, and with them he founded the Augustinian monastery at Arrouaise. Martyr. Deacon at Singidunum (modern Belgrade, Serbia). Martyred with his servant, Saint Stratonicus, in the persecutions of Licinius. Related to Saint Ismael, Saint Oudoceus, Saint Melorius, Saint Tugdual and Saint Judictel. Sixth century missionary to Cornwall, England. Llanelian in Anglesey and Llanelian in Denbigshire are named for him. A slave, belonging to Constantia, the wife of the emperor Licinius. To safeguard her vow of chastity, she ran to Saint Basil of Amasea. She was arrested and sentenced to death for being a runaway slave. She is considered a martyr because her running away was a direct result of her faith and personal vows. Monk. Abbot of Saint Meen Abbey. Bishop of Aleth, Brittany, France. Servant to Saint Hermylus at Singidunum (modern Belgrade). Martyred with Hermylus in the persecutions of Licinius. Priest. For preaching Christianity in territory held by the Saracen prince Walid, he was mutilated and executed. Martyr. Canon of Saint Denis, Liège, Belgium. Benedictine monk at Saint Vannes monastery, Verdun, France. Founded the monastery of Saint Laurence at Liège, and served as its first abbot. Bishop of Caesarea. Worked in the Council of Nicaea in 325. Highly praised in the writings of Saint Athanasius of Alexandria. Mercedarian monk at the monastery of Santa Maria degli Ulivi. Benedictine nun at Saint Leonard's, Liege, Belgium. Abbess of the Cistercian Argensolles Abbey, diocese of Soissons, France. Priest. Martyred in the persecutions of Abderrahman II. Hermit. Priest. Travelled from Palestine to Europe. Worked with Saint Hilary of Poitiers to oppose Arianism. Fifth century relative of a Cornish chieftain. Churches are dedicated to him in Cornwall. Monk. Martyred in the persecutions of Abderrahman II. Fifth century bishop of Maastricht, Netherlands. Bishop of Trier, Germany. Martyr. Forty soldiers martyred in the persecutions of Gallienus.